Note: The locations of the electric systems are illustrative and are not geographically accurate. The sizes of the circles are roughly indicative of electric system size. Electricity generated at power plants moves through a complex network of electricity substations, power lines, and distribution transformers before it reaches customers. In the United States, the power system consists of more than 7,300 power plants, nearly 160,000 miles of high-voltage power lines, and millions of low-voltage power lines and distribution transformers, which connect 145 million customers. Local electricity grids are interconnected to form larger networks for reliability and commercial purposes. At the highest level, the United States power system in the Lower 48 states is made up of three main interconnections, which operate largely independently from each other with limited transfers of power between them. The Eastern Interconnection encompasses the area east of the Rocky Mountains and a portion of northern Texas. The Eastern Interconnection consists of 36 balancing authorities: 31 in the United States and 5 in Canada. The Western Interconnection encompasses the area from the Rockies west and consists of 37 balancing authorities: 34 in the United States, 2 in Canada, and 1 in Mexico. The Electric Reliability Council of Texas (ERCOT) covers most, but not all, of Texas and consists of a single balancing authority. The network structure of the interconnections helps maintain the reliability of the power system by providing multiple routes for power to flow and by allowing generators to supply electricity to many load centers. This redundancy helps prevent transmission line or power plant failures from causing interruptions in service. These interconnections describe the physical system of the grid. The actual operation of the electric system is managed by entities called balancing authorities. Most, but not all, balancing authorities are electric utilities that have taken on the balancing responsibilities for a specific portion of the power system. All of the regional transmission organizations in the United States also function as balancing authorities. 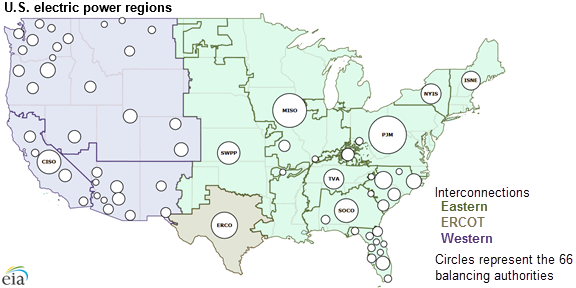 ERCOT is unique in that the balancing authority, interconnection, and the regional transmission organization are all the same entity and physical system. A balancing authority ensures, in real time, that power system demand and supply are finely balanced. This balance is needed to maintain the safe and reliable operation of the power system. If demand and supply fall out of balance, local or even wide-area blackouts can result. Balancing authorities maintain appropriate operating conditions for the electric system by ensuring that a sufficient supply of electricity is available to serve expected demand, which includes managing transfers of electricity with other balancing authorities. Balancing authorities are responsible for maintaining operating conditions under mandatory reliability standards issued by the North American Electric Reliability Corporation and approved by the U.S. Federal Energy Regulatory Commission and, in Canada, by Canadian regulators. These operators monitor the grid to identify potential problems before a situation becomes critical.